All of the world’s best R48 stars took to the celebrated courts at the New York Athletic Club, with each star aiming for a spot in Sunday’s finals. Paul Brady and Catriona Casey aimed to maintain their perfect records on their respective R48 and WR48 tours, while the game’s top men’s and women’s stars targeted upsets of the game’s most dominant players. Andy Nett overwhelmed Irish phenom Colin Crehan in the first R48 quarterfinal match of the morning, 15-2, 15-8. Nett ended the teenager’s impressive R48 debut, hitting 15 ace serves in the two-game match. Nett advanced to the semifinals for the first time in R48 history, advancing beyond the quarterfinals for the first time in 18 attempts. Sean Lenning avenged his 2014 NYAC loss to Jonathan Iglesias, destroying his former vanquisher 15-1, 15-0. Lenning was simply outstanding, making just one error against 24 winners in the 17-minute match. 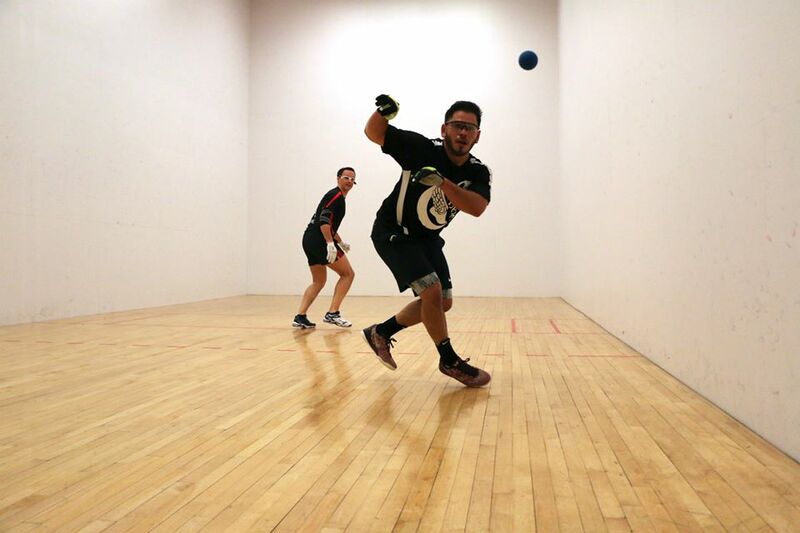 Naty Alvarado returned to the R48 tour after a five-month hiatus refreshed and playing his best handball since the R48 I season. Alvarado faced longtime rival Emmett Peixoto in the quarterfinal and was seeking his first win over Peixoto since the R48 II season. Alvarado played stunning handball throughout, dominating game one to win 15-4. Alvarado surrendered a 7-4 lead to Peixoto in game two and trailed 10-4 after a six-point Peixoto run. Undaunted, Alvarado scored the final eight points of the match to advance to his third R48 semifinal in his last three starts. Paul Brady found himself in unfamiliar territory, facing an opponent that defeated him in their last encounter. Mando Ortiz was seeking an unprecedented two-match winning streak against the WPH R48 #1, but Brady quickly dismissed any Ortiz hopes, racing to a 9-1 lead in game one. Ortiz would cut the deficit to 10-13, but Brady closed out the first frame with two kill shots. Brady needed to hit just 10 shots to win the first eight rallies of game two, serving six aces and two first-strike kill rallies. Brady cruised to the semifinals, winning 15-10, 15-2. Sean Lenning entered the first semifinal as a massive favorite over Andy Nett, having never lost to Nett and playing arguably the best handball of the event through the first two rounds. Lenning aimed to assert his aggressive serve-and-shoot style early in the semifinal, but Nett proved to be up for the challenge. Nett matched Lenning’s power and intensity throughout the first half of game one and battled Lenning to a 7-7 tie. Following a timeout, Lenning appeared to be deflated while Nett surged, scoring eight of the game’s final 10 points to build a one-game lead. Nett continued to ride the momentum in game two, leading throughout with a dazzling display of speed and re-kills. Lenning appeared to be out of sorts, making errors and strange shot selections while lacking the fire that seemed to burn in his earlier match. Nett arrived at match point at 14-10 and closed out the match 15-9, 15-11 to clinch his first finals appearance. Paul Brady faced former arch-rival Naty Alvarado in a rematch of the 2006 U.S. Open and Nationals finals. Brady cruised in game one, never allowing Alvarado to set his feet or to become comfortable in the server’s box, claiming game one 15-2. Alvarado bounced back to start the second frame, turning the tables en route to a 7-1 lead. Alvarado narrowly missed a right corner kill that would have given him an 8-1 lead and Brady seized the opening. Brady scored 13 consecutive points to take a 14-7, ultimately clinching the victory 15-2, 15-10 to meet Minnesota’s Cinderella Story in the final. Catriona Casey extended her scoreless streak in the quarterfinals against Yvonne August, winning 15-0, 15-0 for her second consecutive WR48 match without allowing a point. Aoife McCarthy started slowly in her quarterfinal match against Maria Dugas, dropping an error-filled game one 15-9. McCarthy was sharp to start game two, building a 10-1 lead and holding off a Dugas charge to even the match at one game apiece. McCarthy played flawlessly in the tiebreaker, booking her first trip to a WR48 semifinal with an emphatic 15-0 tiebreaker. Ciana Curran defeated WPH R48 #2 Jessica Gawley, while compatriot Martina McMahon defeated the highest seeded American Danielle Daskalakis in a battle of the two best lefties on the WR48 tour. Casey started slowly against McCarthy in the first WR48 semifinal of the evening, falling behind 4-1 and 6-2 before figuring out the crafty WR48 star from Mullingar. Casey demonstrated her trademark brilliance for the remainder of the match, scoring 28 of the next 29 points in the match to advance to her sixth consecutive WR48 final. Ciana Curran played an entertaining match against Martina McMahon, with both athletic ladies playing numerous 15+ shot rallies that were often ended with crowd-pleasing rollouts. “It just seemed like there were a lot of really great rallies with Ciana winning most of them,” revealed WPH official JT Hingey. Curran advanced to her first WR48 final in her first WR48 start, 15-4, 15-7. The SR48 featured several of the closest matches of the day, as New York’s Andy Rousseau defeated Danny Bell 26-24 and Chris Watkins defeating Kevin Kopchuk 27-25 in quarterfinal action. Top-seeded Dan Armijo overcame Rousseau in the semifinals, while second-seeded Andy Schad defeated Chris Watkins in an entertaining 25-20 tussle. Armijo and Schad will meet for the SR48 NYAC ’15 championship in a rematch of Tucson’s SR48 14 quarterfinal clash won by Armijo in overtime. How can you watch the finals on Sunday? To watch Sunday’s finale from the New York Athletic Club, go to the Watch ESPN App at http://es.pn/1GygXbB and enjoy all of the drama of the R48, Wr48 and SR48 in stunning HD!